Healthrider treadmills are manufactured by the fitness giant ICON Fitness. Although there are many models available in the $700 to $2,600 price range, the jury is out on whether you’re getting what you paid for with these machines. Part of the problem is that ICON just doesn’t seem to back up their low- to mid-range products much with customer service or support. It’s a shame that you don’t get the benefit of ICON’s huge research and development money when you look at HealthRider Treadmills, but most of that investment seems to go toward their higher end brands. Although there is some innovation on these treadmills, some experts don’t see them as real improvements. UPDATE: As of 2017, we no longer recommend Healthrider treadmills as the parent company puts very little focus on this brand. You get a lot more value as well as updated technology on ICON's more popular brand, NordicTrack. Check out the latest NordicTrack models here, where you'll find a treadmill in every price range. It appears as though they might be trying to spruce up the Healthrider brand a bit. The company website has been redesigned with a much cleaner, more user-friendly appearance, which is a welcome upgrade from the poorly executed original website. Also, there are a lot more models to choose from than previously, which could be a good or a bad thing. There are currently 11 treadmills to choose from, similar to the amount you'll find on ProForm and NordicTrack's sites. There are 5 models under $1000, 5 models between $1000 and $2000, and one model, the H70T, at $2,599. 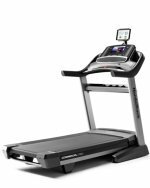 Taking a closer look the new Healthrider treadmills just don't compare to their more popular siblings, NordicTrack and ProForm. The Healthriders are missing many of the features and capabilities you find on those other brands at similar prices. Decks are smaller, iFit technology is missing, even the pricier models don't have touch screens. The top of the line model still has a basic display and none of the bells and whistles you would expect at that price. The iFit compatibility that ICON has included in some of the Healthrider models is a definite plus, adding to the enjoyment and variety of a workout. These treadmills are also attractive and come in a variety of styles, but the cons cancel out the pros. One problem is that Healthrider uses a lot of plastic parts and electronic components from overseas that wear out quickly. This wouldn’t be such a big issue if the warranties were really good, but 1 year parts and labor just doesn’t do it when you’re shelling out $1,000 or more for your treadmill. The end result is a product that’s only good for walking or mild jogging. And if you buy a Healthrider treadmill, you’ll probably have problems after the warranty expires. With ICON Fitness having a mediocre track record in customer service, you may want to look elsewhere. Healthrider H90t - Decent value if you can find it on sale for $700. Healthrider H95t - An amazing find for under $1000; above average scores for powerful motor, big running deck, cushioning, feature-rich console and overall quality and design. 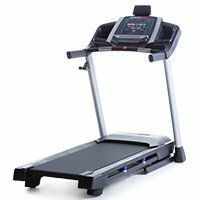 Healthrider H75t - One of the better designed and better built treadmills in the under $800 category. Healthrider H155t - 7" TV, 35 workouts, 1-touch speed and incline controls, 12% max incline level, 3-speed fan and lift-assist folding mechanism. Good deal if on sale. Healthrider R60 - Very good for avid walkers, but serious runners may want to take a pass. Healthrider Pro H500i - Cardio + strength training for total body fitness: fairly good value for casual walkers.